This version enhances the compatibiliy with other systems. The great news is, that there is (besides Natara Bonsai) another desktop companion for Android Outliner, which also has a free version. 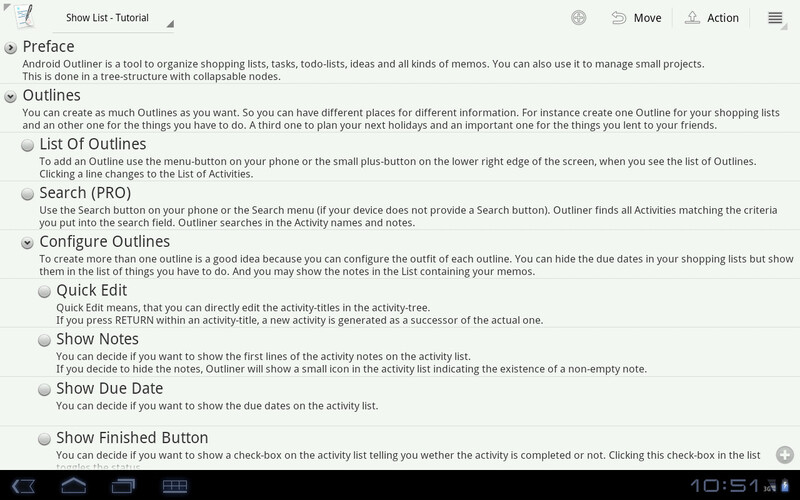 Android Outliner syncs with another desktop application now. Treepad is a well known Outliner, which has a free version (Treepad Lite) and also commercial versions with more features. Treepad Lite is available for Windows and Linux. With Jreepad there is also a Java implementation from another developer which runs on Mac and Linux. 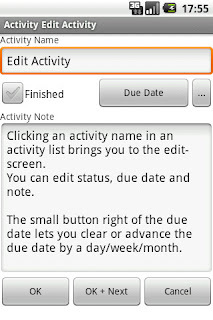 Use the "move mode" to quickly move activities within an Outline (toggle by double tap or menu). 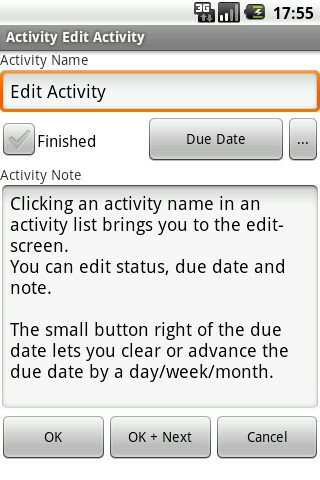 Long click on an item in the list to get additional actions for this item. The wait is over. Outliner finally leaves the beta state and the official PRO version is now available at the Google Play Store. Please consider buying the PRO version to get the additional features or to support future development. See the version history for everything the PRO version adds to Outliner. Thanks a lot to all the beta testers who helped to make Outliner as stable as it is and thanks for all suggestions and feature requests. There is a long list of features to be added in future. I added a privacy statement to the tutorial. It explains in detail what Outliner does and does not with your data and what you can do to keep it private. Outliner never sends your data anywhere unless you explicitely tell Outliner to do so (e.g. if you configure a Dropbox sync). In some cases Outliner writes your data to your SD-card where it may not be secure any more if you loose your phone. This version adds enhancements for newer Android devices and tablets. 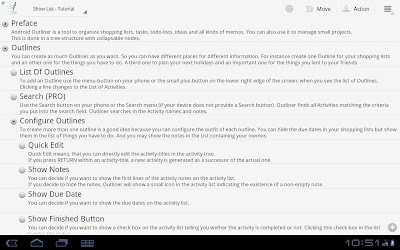 On devices with an Android version 3.0 and above there is now an Action Bar at the top of the screen which provides shortcuts to some actions otherwise found in the menu. You can for instance quickly change the view or toggle move mode. On older devices you reach these actions via the menu button as usually. When importing/exporting an Outline you can now use a file manager to pick the file (the button with the tree dots next to the filename). 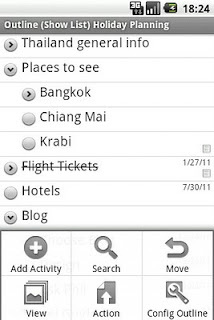 Outliner shows a list of installed applications which may provide a file picker. "OI File Manager" or "ES File Explorer" for instance will do the job and will be automatically chosen if installed. You find these applications at the Google Play Store. This version mainly helps to add and edit items more quickly. Use shortcut keys if you have a device with a keyboard (see tutorial).